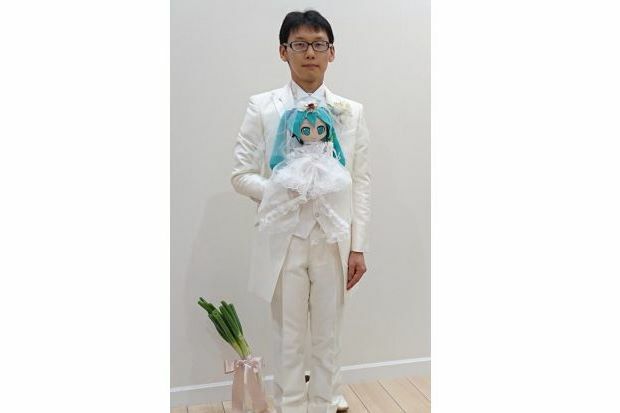 TOKYO - A 35-year-old man from Japan tied the knot with a doll in the likeness of virtual star Hatsune Miku. Hatsune Miku, or simply Miku to her international fans, is the character model designed by artist KEI for the Vocaloid voice synthesizer program by Crypton. Her singing voice was sampled from the voice of voice actress Saki Fujita. The software was released in Japan on Aug. 31, 2007. The fourth version of the software called “Hatsune Miku V4” was released on Aug. 31, 2016. Miku herself has no intricately defined personality, but is rather defined by the songs fans and songwriters make for her. In fact, none of Kondo's relatives attended his wedding to Miku -- an animated 16-year-old with saucer eyes and lengthy aquamarine pigtails -- but that didn't stop him from spending two million yen on a formal ceremony at a Tokyo hall. Her appearance is just the same. While artworks tend to maintain her aquamarine hair, fan art sometimes takes liberties to redefine how Miku looks like. Fast forward to the present, Kondo made his dream come true on Nov 4 with a full wedding ceremony complete with guests and a blushing bride in the form of a Miku doll wearing a white wedding dress. The ceremony was a small and intimate affair with just 39 guests. They included relatives, friends and Japanese Parliament member Taro Yamada and Assemblyman Ogino Otaku, who each shared snapshots of the event through tweets on the same day. What led to the unusual union? Apparently, Kondo had trouble interacting with women due to a traumatizing experience at work. Ten years ago, Kondo was on the receiving end of workplace bullying by female superiors. The experience scarred him to the point that he lost trust in women in general. He was also suspended from work as a result, reports Unilad. Whatever reactions or criticisms Kondo will get for his decision, for the time being, it appeared the man couldn’t be happier at this point in his life. "For mother, it wasn't something to celebrate," said the soft-spoken Kondo. In fact, none of Kondo's relatives attended his wedding to Miku - an animated 16-year-old with saucer eyes and lengthy aquamarine pigtails - but that didn't stop him from spending two million yen (S$24,328) on a formal ceremony at a Tokyo hall. Since March, Kondo has been living with a moving, talking hologram of Miku that floats in a US$2,800 desktop device. He considers himself an ordinary married man - his holographic wife wakes him up each morning and sends him off to his job as an administrator at a school.